Welcome to Country Carriages. 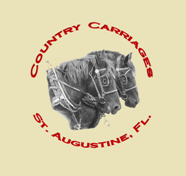 We’ve been operating carriages in St Augustine since 2004. Our beautiful horses and knowledgeable guides take pride in showing off our city. Whether it is a historical tour, engagement, wedding, family reunion or school group ride we are the company for you.